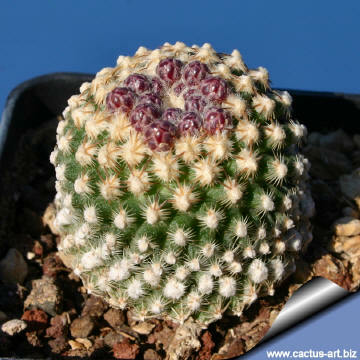 Pediocactus knowltonii (SB304, San Juan County, New Mexico, USA) is the smallest and rarest member of the genus and found only in New Mexico and Colorado in a very limited area. 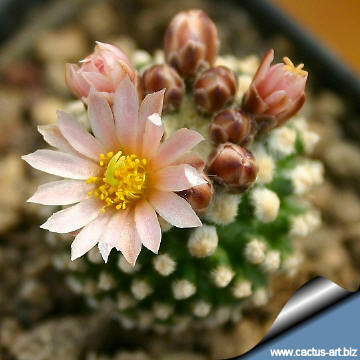 Morphology (Identifying Characteristics): Very small plant (one of the world's smallest cactus) usually solitary or a few in a cluster (Clusters of up to 30 cylindrical stems are reported) barely protruding above ground level. Stems: Globular to short cylindrical, 3.5-5,5 cm tall. 2.5-3 cm in diameter. Areoles: Circular or slightly elongate, At first woolly but become smooth with age. Central spines: This species lacks central spines. Radial spines: Smooth, relatively hard, pubescent, mostly 18-26 per areole, somewhat pectinate, radiating from areole and appressed to the plant reddish tan, pink, or white, 1-1.5 mm and darkest at tip. 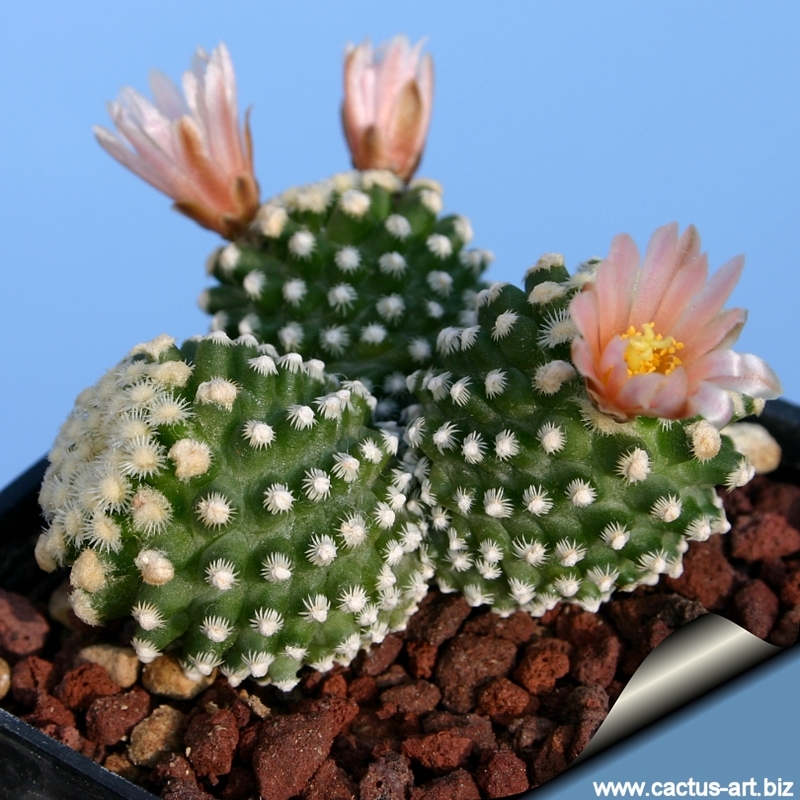 Flowers: Funnel-shaped 1-3.5 cm long by 1-2.5 cm in diameter, fragrant, borne from previous years areoles near apex of plant, pink, , tepals white to magenta, usually pink, stigmata yellowish or pale green, ovary with few tiny papery scales. Blooming season: Early in spring (April or May). Flowers are produced when plants reach 3 or 4 years of age and last only 2 to 3 days and are open for approximately 3 hours in mid-morning and early afternoon. Flower buds are set in the fall after a period of summer dormancy and remain unopened through the winter. Fruit: Flat, barrel-shaped, fleshy, not juicy, on top and approximately 4 mm long. Most plants produce 2 or 3 fruits. Fruits are green-tannish, drying, dehiscent by circumscissile split at top and one or more vertical splits. Fruits are produced from late May to early June and dehisce in mid or late June and on average contain 10 to 12 seeds. Seeds: 1.5 mm long and 1 to 1.2 mm wide teardrop-shaped with low nearly flat tubercles, hilum sublateral and with a whitish strophiole. Similar Species: Could be confused with some species of Escobaria, but it differs in having no groove on tubercles, ovary and fruit with scales, fruit dehiscent, and seeds larger and not pitted. Closely related to P. simpsonii, but it is separable by recurved appressed radial spines with no central spines; some juveniles of P. simpsonii lack central spines and are nearly identical. Spines are all radial, mostly 18-26 per areole, somewhat pectinate 1-1.5 mm long. 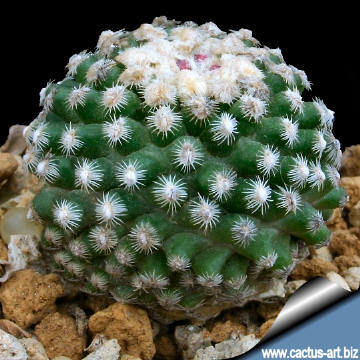 Scientific Name: Pediocactus knowltonii L. D. Benson, Cact. Succ. J. (Los Angeles). 32: 193. 1960. Toumeya knowltonii anon., nom. Nud. 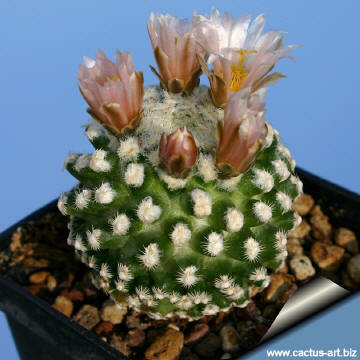 Distribution: Pediocactus knowltonii is a rare, endemic cactus that is presently known to occur on a single hill in a very limited area in the northwestern part of San Juan County and Rio Arriba counties and Colorado's Archuleta County, New Mexico on the Colorado border. ± 2000-2300 m. ) There may be only 2 Knowlton's miniature cactus populations, the largest of which occurs in a 6 ha area south of La Boca, Colorado and the other occurs in nearby Reese Canyon. Type locality: 1 mile south of La Boca, Colorado. Habitat: Gravel pavements and hill sides on red-brown clay soils in pinyon-juniper (Pinus edulis -Juniperus scopulorum) woodlands and in mixed sagebrush (Artemisia spp.) shrublands often in sites where other vegetation is often lacking. The climateis characterized by little precipitation, extreme summer heat, low humidity, and very cold winters. Annual precipitation is approximately 300 mm, and most comes in the summer and winter months. 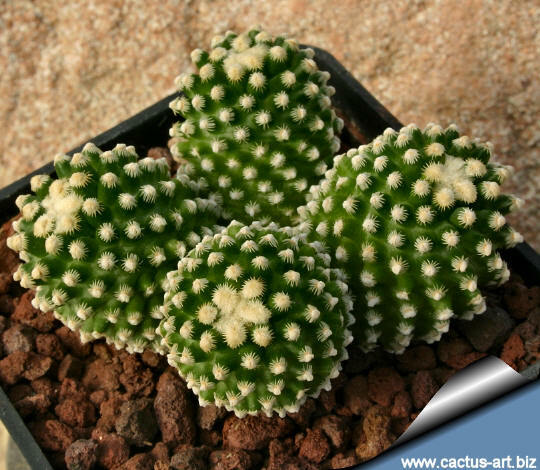 Etymology: The genus name "Pediocactus" derives from the Greek words “Pedion” meaning “plain/level” referring to the general habitat of the plant on the Great Plains, and the word “cactus” ( an old genus name) (The genus name implies: “cactus of the plains”). Cultivation: They are relatively difficult to grow from their own roots, and are cultivated only by expert cactus enthusiasts. Nevertheless, plants on their own roots are very hardy. They don’t tolerate living in humid and heated green houses. Place them in a ventilated position; they like "wind". Avoid direct sunlight exposure in summer. Water moderately, only from early March to May. The rest of the year keep them in dormancy. They are exceptionally slow growers. For this reason they are frequently grafted on strong hardy cactus stocks like Opuntia and Echinocereus. The flowers buds stay dormant on the plant apex all winter, they will then open in spring when the temperatures rise. To avoid any damage to the buds, the grafted plants that stay in heated greenhouses should not be let to completely dry out. Some light watering in winter is useful for keeping the flowers hydrated and healthy. Propagation: Seeds: Temperature for optimum germination: night minimum approx 17 day maximum to near 40 C at any time of year with proper temperatures and daylength (ca.13-14 hours); it is possible to extend day-length with artificial lights. Anyway the seeds germinate slowly with difficulty and a low rate of success (But germiation is comparatively easy if compared with other Pediocactus and Sclerocactus species and often new seedling cluster spontaneously around the plant every year), scarification and stratification help, alternate freeze and thaw both wet and dry, but don’t keep wet, alternate wet and dry with changing temperature. Germination can take several years so keep pot and try again next year. 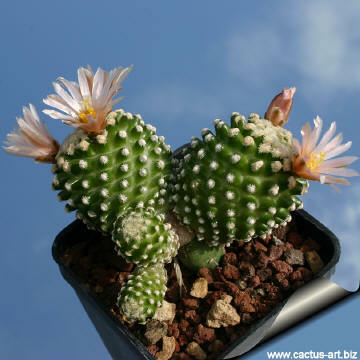 Seedlings do not do well either, and some die each year, for this reason plants are commonly grafted on hardy stocks like Opuntia compressa in this case they are easy to grow and no special skill is required.